In any kitchen renovation project, you can expect the cabinets to be at the heart of the design. 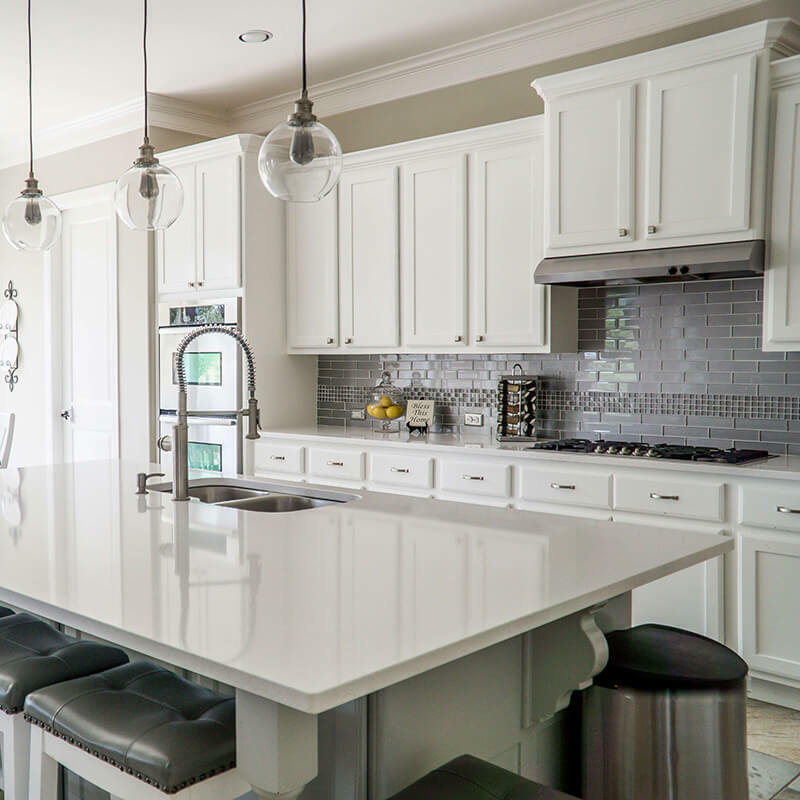 They represent the bulk of infrastructure in any kitchen and quality kitchen cabinets in your home have many benefits for the overall durability, style, and value of your kitchen – and your home. 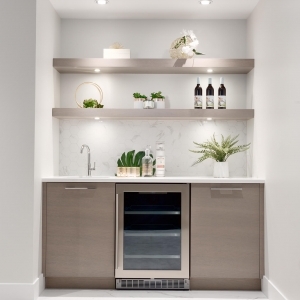 These days, cabinets are made from just about everything under the sun – particle board, recycled wood fibres, plywood, and solid wood being some of the more popular options. Each offers a substantial list of benefits and drawbacks. So, what should you expect in high-end kitchen cabinets? Should a cabinetry specimen lack one of these pillars, in our opinion, the cabinet cannot be truly called a quality item. Here’s why: The very popular IKEA brand aggressively markets and sells great-looking cabinets that are perceived as high-quality thanks to their ability to mimic top tier European cabinetry. However, the manufacturing process and materials used in these items are not reminiscent of high-end quality. They typically use cheap materials like lightweight press board, MDF, and cheap slides and hinges – all under the guise of an aesthetically pleasing solid wood door and/or center panel. Custom cabinet dimensions will always vary depending on the type of project they’re used in, but the materials used in a quality kitchen cabinet always remain the same. 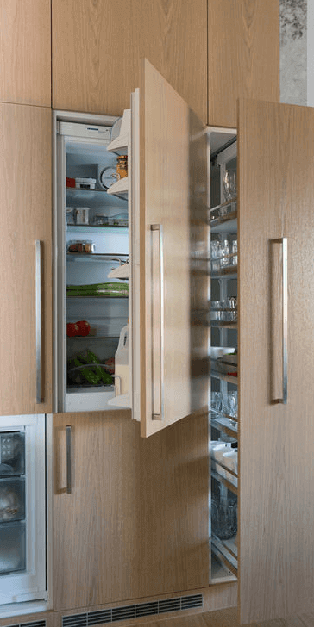 KAD cabinetry doors are a consistent thickness of ¾”, made of a variety of high-quality materials, from solid wood profiled doors, to wood veneers, and high-quality laminate veneer doors laid up on hybrid plywood and MDF core, providing a lightweight, stable substrate, to avoid veneer telescoping and warping. 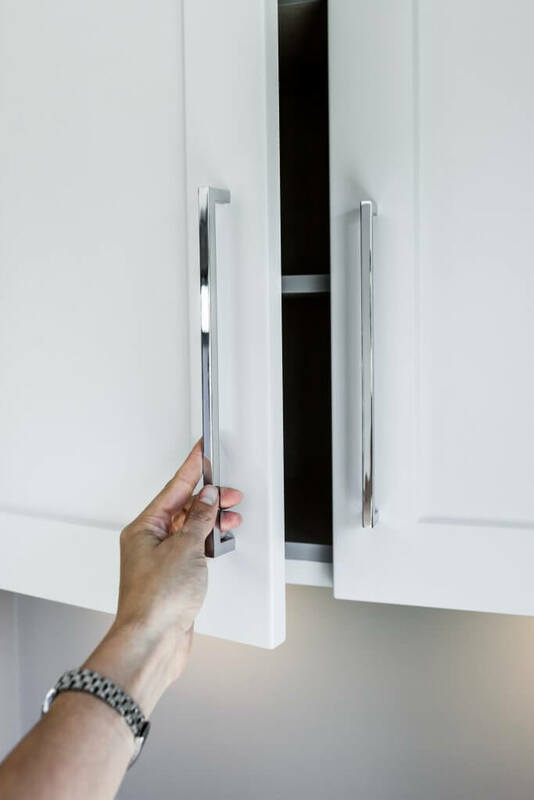 Instead of a ⅛" thick back with hanging rails on our cabinet back panels, we opt for a full, solid ⅝" thick back for increased strength and quality, and to prevent the cabinet from twisting and shifting shape during the installation process. In essence, cabinets are stylish wooden boxes affixed to your floors and walls – this simplified explanation doesn’t mean that they deserve any less attention-to-detail or dedication to quality materials. The cabinets are also comprised of two different parts – the box, and the door. Cabinet boxes should always be made of quality plywood (typically maple or birch), MDF, or rigid and dense particle board. 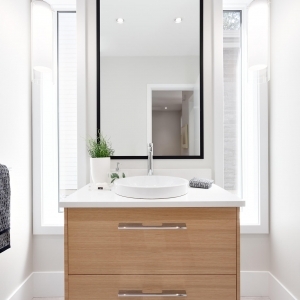 Quality cabinetry companies may still offer a high-quality melamine product laid upon particle board – as it is a suitable fit for many projects. Melamine has several different colour options and is a lower cost alternative. As with any material, there are different quality grades for a melamine/particle board product, and Kitchen Art Design hand selects the highest weighted melamine material available. When we say plywood, we’re not talking about the materials used to inexpensively and quickly frame houses or build a garden shed – we’re talking about furniture-grade ply that is able to stand up to constant use and abuse, that has the potential to perform – in some cases, better – than solid wood. Solid wood boxes, on the other hand, are rarely used – unless you have a limitless bank account and are happy waiting six months for delivery – there is really no such thing as a “solid wood” cabinet box. When manufacturer’s make this claim, what you are typically getting is a cabinet box constructed using a plywood core with a hardwood veneer. Many organizations choose to focus their manufacturing efforts on the cabinet door, which receives the most use and attention. 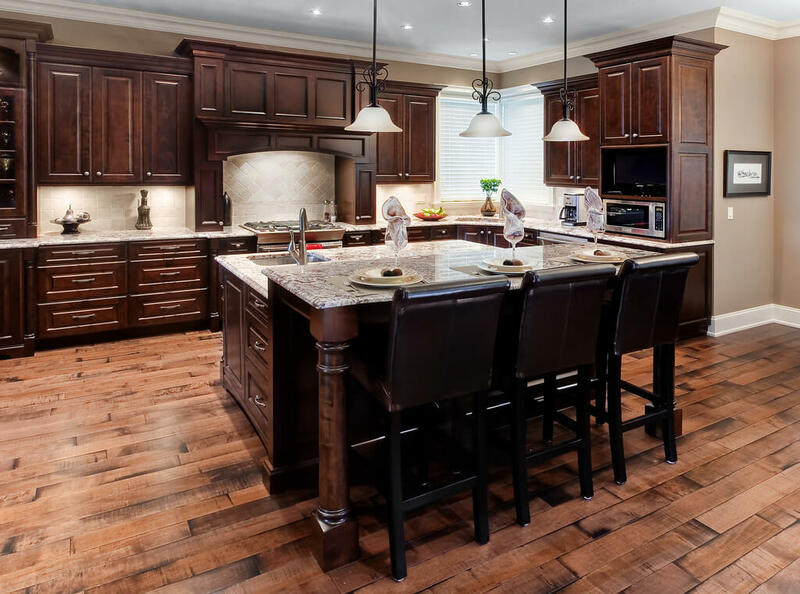 Solid wood doors, drawer fronts, and cabinet face frames are standard features in many high-quality kitchen cabinets for their unparalleled durability, strength, and style. How the drawers are constructed says a lot about the quality of your chosen cabinets manufacturing process. A standard, everyday drawer will be joined by gluing the cabinetry components together and reinforcing them with stapled corners. 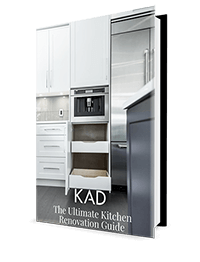 Part of KAD’s dedication to quality is using only the most reliable and durable of processes, and so we never use this method – to us, it’s evidence of cutting corners, and contributes to cabinetry degrading much quicker. In a quality cabinet, there are two high-end options that consumers should expect to receive. Doweled boxes are an excellent step-up in terms of quality and are the standard method of manufacturing for Kitchen Art Design. Above doweled boxes, the highest quality joinery comes in the form of dovetailed drawer boxes. 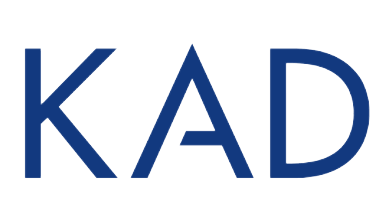 This is KAD’s preferred method of construction, representing the highest quality of joinery on the market, and an option that KAD happily stands behind if the project budget permits. Dovetail drawers are constructed of solid wood material; either birch or maple. 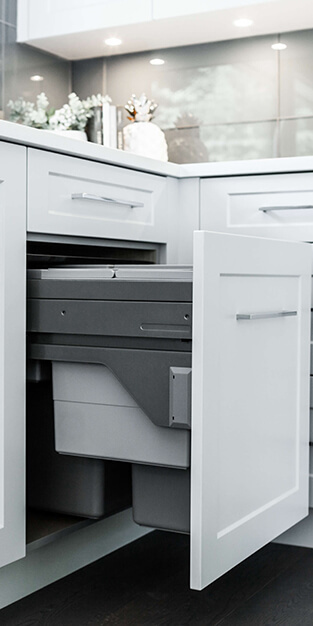 A seldom discussed aspect of high-quality kitchen cabinetry, drawer slides vary in style, but customers insisting on the highest quality for their dream kitchen project should always insist on full-length undermount extension, and soft closing brackets to minimize the potential of breakage, and general wear and tear. KAD only uses Blum drawer slides, as we can stand behind this product to not fail after years of heavy use. 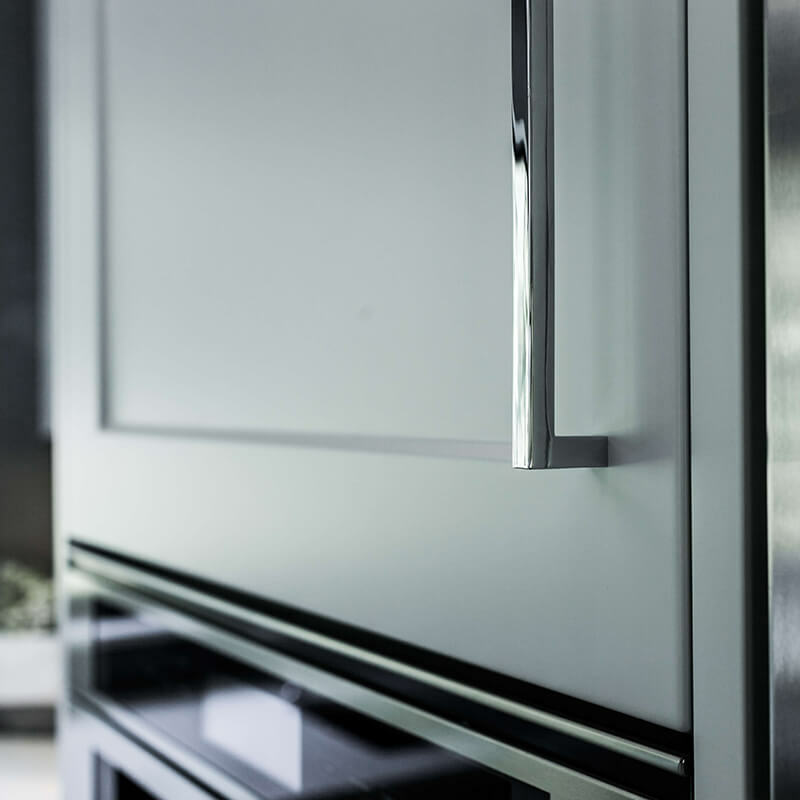 Hardware is an aspect of cabinetry that is overlooked by many. People often think a door hinge is a door hinge, is a door hinge – wrong. KAD uses only sturdy and stylish Blum hardware that exclusively features soft-close technology to minimize damage from consistent use. 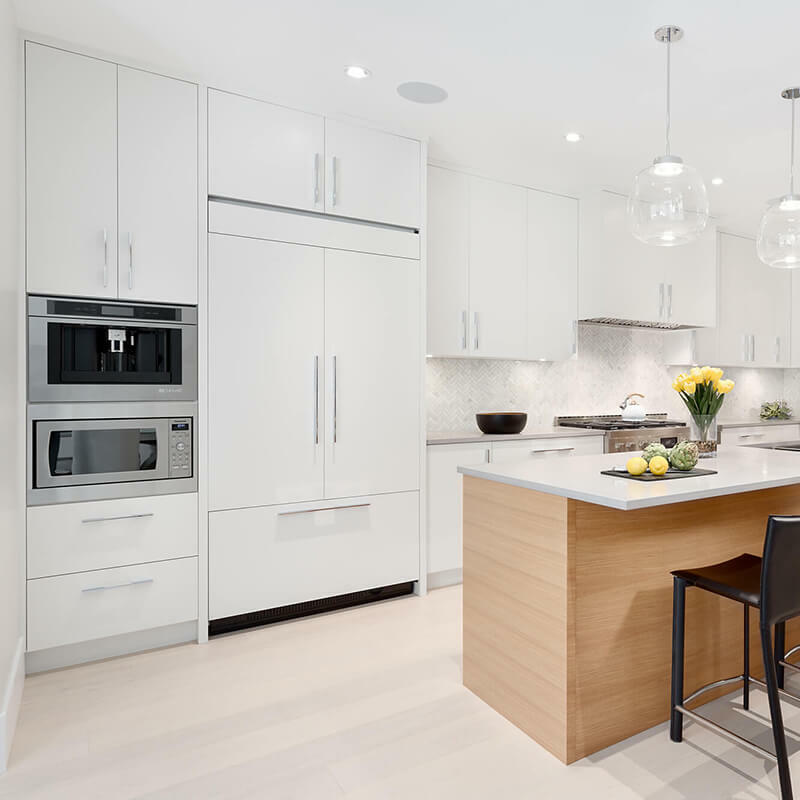 Apart from the visual styling of your preferred cabinetry, the added aesthetics of your finishes are what truly separates a good kitchen and a great kitchen. Finishes like drawer handle, faucets, and sinks are the proverbial top hat of the cabinet and help elevate the aesthetic of the kitchen in a subtle way that helps guide the eye to the cabinet and its fit-and-finish. Depending on the style of your renovation, you may wish to investigate any of these stunning options. The heart of the home always needs good bones to support it. Quality cabinetry in a sound investment in your kitchen overhaul project that pays for itself time and time again. The high-quality attributes of custom cabinetry in this post represent the upper-tier of rigidity, style, function, and longevity. 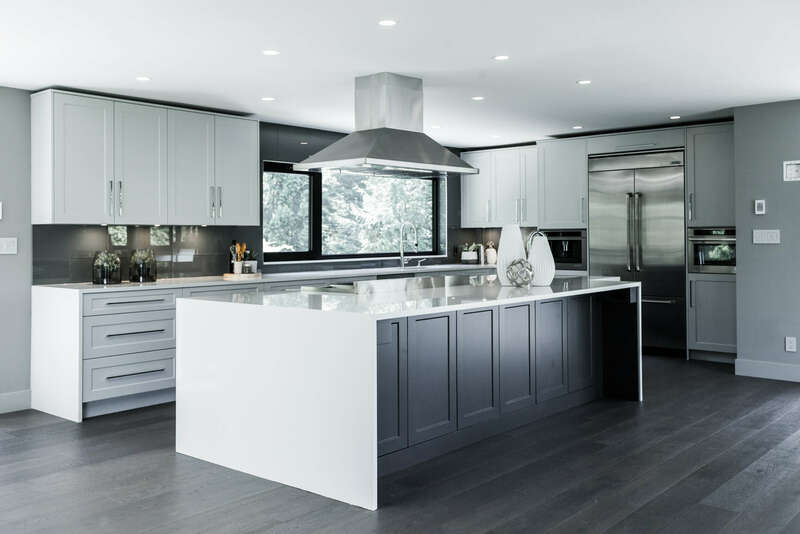 Make sure you are familiar with your custom kitchen cabinet design team by taking a look at customer reviews on a trusted source such as Houzz. READY TO BUILD YOUR DREAM? You’re proud of your dream kitchen - and we know you built it to use it. 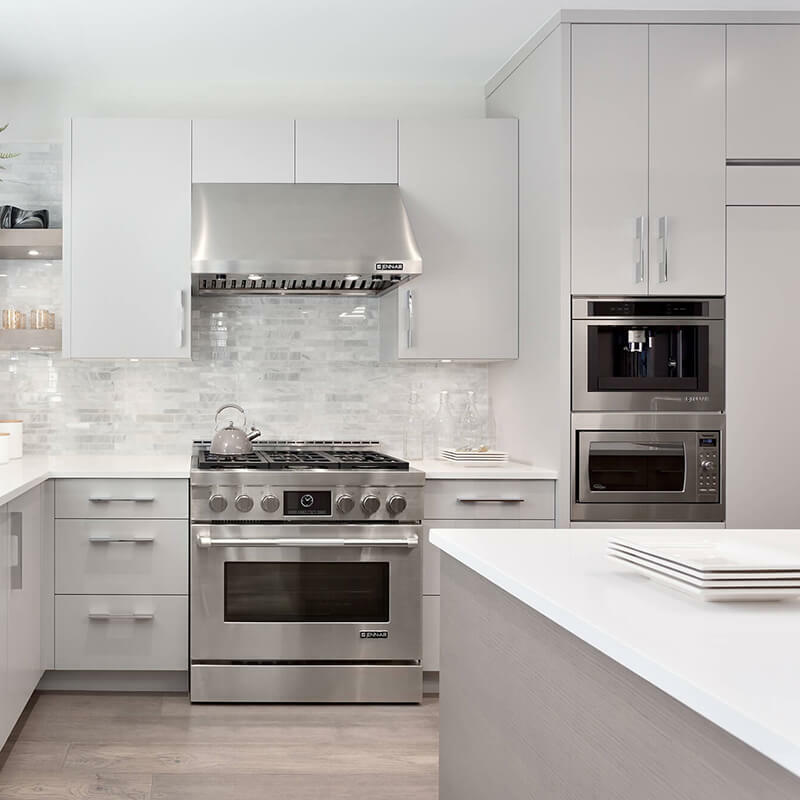 Despite your high quality custom cabinetry occupying the upper tier of quality and durability, these basic treatments and care processes should always be monitored to ensure your kitchen looks great and provides you with decades of reliable function and style.